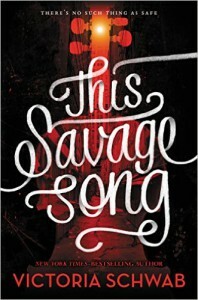 I can't believe this is my first Victoria Schwab book. I've been putting off reading her books for awhile now and I honestly don't know why. This book has such rave reviews, so I knew I had to at least give it a shot. I was really hoping that I would love it because it sounds amazing. Maybe it was my high expectations, but I'm not in love with this book as much as I wanted to be. I was expecting to be wowed, to feel things, to never want to stop reading, etc., but while this is definitely above average, it wasn't the flawless masterpiece I was expecting. The book really shines with the unique world that Schwab has created. Monsters that are born from violence made by humans is so original and the idea kept me engrossed in the story. I wanted to the know the the whys of everything. Throughout the book I kept thinking "how could this possibly be resolved/fixed" and that makes me want to keep reading. I loved the little song that pops up throughout the book about the monsters, it's creative and chilling. I really loved August as a main character, if not only because his character plays the violin (I have a weakness for violin playing characters, don't ask me why). I did enjoy his character for more than his music though. I really liked how he's a monster dealing with the fact that he doesn't want to be one. It's not a unique idea, but I really loved how it was executed in this story. It felt fresh and out of all the characters, I think I felt for August the most. The story falls a little flat in the beginning. Kate and August are both new students, they're kind of drawn to each other/keep running into each other without meaning to, and at first they don't seem to like each other much. It's not a very original start to the story if you take out the monsters, but the story redeems itself with absolutely no romance. Honestly, I didn't see that coming. I thought for sure there might be some sort of romance, so I was pleasantly surprised that a friendship developed instead. I didn't dislike Kate, but she also wasn't my favorite, but I loved her friendship with August and how it developed. The second half of the book is intense and so many things start to happen. I absolutely loved it and the ending left me kind of chilled. I really need the next book and I've heard it's even better than the first.